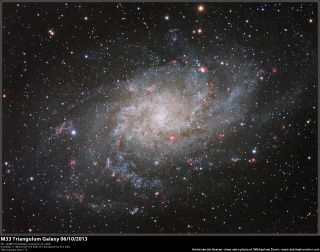 The Triangulum Galaxy, catalogued Messier 33 or NGC 598, is a spiral galaxy located approximately 3 million light years from Earth in the constellation Triangulum. André van der Hoeven teamed up with Michael van Doorn to take the photo, which was sent to SPACE.com on Oct. 8, 2013. Two astrophotographers teamed up to take this stunning image of one of the most distant permanent objects that can be viewed with the naked eye: the Triangulum Galaxy. Based in the Netherlands, André van der Hoeven joined Michael van Doorn to create this stunning image of the Triangulum Galaxy, a spiral galaxy located approximately 3 million light-years from Earth in the constellation Triangulum. A light-year is the distance light travels in one year, about 6 trillion miles (10 trillion kilometers). Van Doorn used a Celestron C11 with Hyperstar at f/2 to take his portion of the imaging. This set up provided a focal length of about 560 mm, giving a wide field with a high sensitivity, according to van der Hoeven. Van der Hoeven used a TEC-140 telescope and a QSI-583 camera for his part in the imaging. The total exposure time was 11 hours. "We decided to combine the RGB and Ha from the Hyperstar with the resolution and detail of the TEC-140 that I use," van der Hoeven wrote SPACE,com in an email. They shared the image on Oct. 8.